The 2016 presidential campaign will go down as one of the most divisive in US history. Read what it was like for high school senior, Lilly Hackworth, to vote for the first time during such a contentious race and how she used Facing History and Ourselves to help her navigate such a turbulent political climate. Students from the Notre Dame High School Facing History Student Leadership Group at their mock election. From L to R: Priscilla Guadarrama, Rabab Karimjee, Emily Vanuy, Jasmine Lee, Mariana Haro, Arshita Sandhiparthi, Lilly Hackworth, and their teacher, Eran DeSilva. Lilly Hackworth is one of the few students at her school who voted in the 2016 US presidential election. 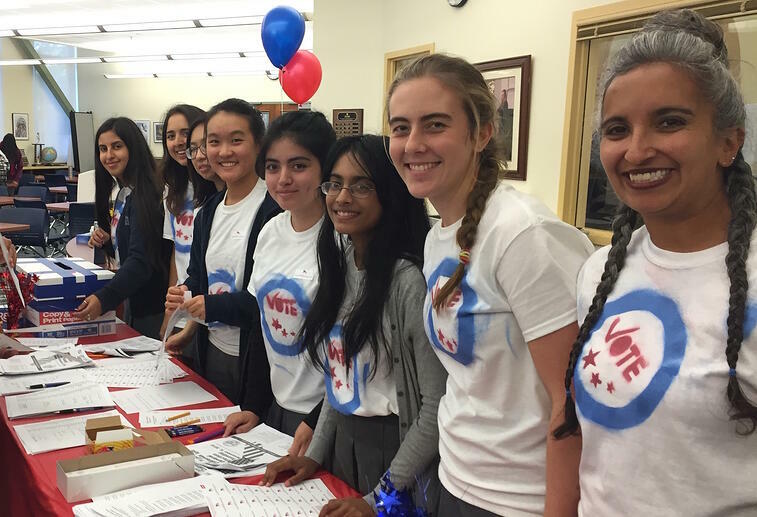 The senior at Notre Dame High School in San Jose, California turned 18 just in time to register to vote. She’s been following elections since she was around 10 years old and quickly picked up on the negative tone of this campaign season. She saw these personal attacks not only in debates between candidates but also on social media outlets between her peers and other adults. Being a Facing History student helped her navigate political tensions inside—and outside—of the classroom. She credits Facing History with enhancing her commitment to fighting discrimination and staying civically and politically engaged. By studying genocide and having difficult conversations about indifference and violence in her classrooms, she’s learned how to respond in respectful ways to the varying perspectives around her. She was able to apply this to the current political climate. Most importantly, Facing History taught her she has the agency to take action. She organized a mock student election with her peers in the Facing History Student Leadership Group. The group, which is comprised of different schools, organizes and holds events that raise awareness and advocate for social justice issues. The mock election was one way she could mobilize those around her to be more civically engaged. She and her peers worked hard recreating the California ballots, designing info-graphics about ballot questions, and handing out voting packets. They opened it up to the entire school, encouraging all students to get involved politically now so they can be informed when they are finally of legal age to vote. Participating in a real election for the first time, particularly this one, was exciting to the senior who plans on studying both international relations and computer science when she heads off to college later this year. She sees voting as her civic duty and a way to make her voice heard. "I really liked the experience," she said. "I thought it was really important and amazing that I could vote and that I could try to be a voice for the people who can’t yet vote." That’s why she hopes more young people become politically active sooner and make their voices heard during presidential and midterm elections, which she feels are often overlooked. Looking toward future elections, she hopes candidates will bring their campaigns back to being policy focused instead of centered around personal attacks. And she hopes people bring empathy back into political conversations. Inspire young people to take action in their lives with stories from our resource, Choosing to Participate. Focusing on civic choices, this collection of readings and stories helps students understand how the choices they make about themselves and others in their community, nation, and world shape us as individuals in a global society.